Prairie City Bakery’s mission is to “wow” customers with simplified baking. It’s clear that everything they do is with the customer in mind, and providing them with a high quality, handcrafted-style product. They began with only muffin tops and now Prairie City Bakery offers more than 70 products. A fast-growing company. Although the product says super-sized, be aware, the image is not to scale. What’s lovely about the design is that the wavy edges create an imperfect, handcrafted look. It’s a lot like a cookie, don’t you think? The color scheme is bold which makes the product as a whole stand out. On top of that, the label also features a lot of information. It uses the small space it has to create a big impact. This Packaging World article discusses 5 ways packaging inserts can create a personalized experience for customers. With the growth of digital label printing, customization has grown. It’s time to think outside the box and offer a personal experience like no other. It’s easier than you think, but it also requires innovation and creativity. Coke changed the packaging game the first time it released names on their bottles. The rise of digital printing offers short runs of various designs to create a personalized feel when customers shop. More recently, this has been seen for LIFEWTR where the art used on the bottle is as unique as the person buying it. For your products, digital labeling is an excellent way to create a unique experience for your customers. Create many, many different designs for your product. Also, consider the shipping location. Incorporate local culture into the design, or even, simply include the city name. Although this technique is not personal to your customers, it’s personal to their situation and will elicit warm and fuzzy feelings. Labeling technology refers to RFID (Radio Frequency Identification) or NFC (Near Field Communication) that connects to customers’ phones. While RFID is long range, NFC is short range. With NFC, the customer also needs to hold their phone up to the label for a pop-up window to appear. This also only goes into effect if they have the NFC capabilities turned on. This creates an easy way for brands to share custom content through their labels. While QR codes link customers to digital content, they don’t involve labeling technology RFID and NFC do. QR codes are a simple, cheap way to share content. In this case, a secondary label with tech would not need to be added to your standard label, but it makes the design change from label to label. When designing labels, consider how to link customers to your content. What format are your customers most responsive to? A/B testing is a fantastic way to see if they will use the technology offered, and their engagement levels (through studying test subjects or observing web page analytics). Many social media users find bots impersonal and annoying. That said, if used understanding the customers’ needs, it is a very useful tool for personalization. Instead of linking customers to videos or blog posts, the link connects them to a page where they can carry on a conversation with your bot. This is a much more interactive and engaging experience with your content. Now, they can access all the helpful information they’re looking for from your blog in easy to digest messaging. As the conversation flows, their understanding of the product and how to use it grows. So does their sense of connection and relationship with your brand. Connect customers to various quizzes you have specifically created for the product they bought. A simple QR code with a call to action by it is enough to catch their attention and their interest with this personalized experience. Through these quizzes, show them ways to use the product, and upsell other products in your line. For example, if you are a distributor of produce, create a quiz that leads the customer to their ideal meal match based on their time commitment, cravings and skill level. If accessing the quiz in store, the customer picks up the products they need to make the recipe. If accessed at home, the customer saves the link for next time. Either way, they are entertained with a personalized experience. This develops the relationship between them and your brand. Another tactic is to leave the customization up to your customers. With Valentine’s Day coming up, promotional gift packaging is the key to this technique. Provide customers with space to write notes, draw, and generally connect to the recipient. Make an ad-libs style poem, provide space for the “to” and “from” notations, or simply give them space. Above is an empty Monrovia R&D design and pot. The label uses metallic stock to catch the customer’s attention and the white space provides them with room to customize. It’s simple, classic, and romantic. It also compliments the product. A personalized experience should be a creative experience. To delight your customers, consider the problems you help them solve. Show them new and exciting ways to use your product. Most importantly, don’t be boring. This video portfolio highlights some of Great Lakes Label’s clientele and label samples. You can also check out our work by clicking here. As you can see in the below image, this video even highlights our research and design work. As a result, it covers the various uses of innovative labeling techniques. This even includes embossing, foiling, and motion coat. There are a variety of innovative labeling techniques found in the video portfolio. This is because every technique offers something different in creating a captivating label. So, it creates a different aesthetic and a different experience for the in-store customer. One of these examples is the above THYK R&D label which uses the holographic technique, Motion Coat. We guarantee your competition isn’t using MotionCoat, so consider it instead of others. This is because they either don’t know about it, or they ignore the potential of the technique. Brands incorporate foiling, especially when conveying luxury. However, Motion Coat is an undiscovered gem. Not only does it catch the light, but it creates a unique, and bumpy texture customers will want to get their hands on. Both pictures and videos are included in this video portfolio. Here’s why. This video portfolio has a mixture of picture and video content because it better showcases how the product will look when customers are holding it in their hands. While pictures are worth a thousand words, sometimes they don’t do labeling techniques justice. With this video, you can look at the shine, depth, and even the texture of the products shown just like you’re there in-store holding it. Are you interested in what you see? Contact us to receive a package of samples personalized for your labeling needs. At Great Lakes Label, we’re always updating our portfolio web page with new clients and samples of what we do. This video highlights how our products look on the grocery store shelf, but also the wide range of industries we serve. We have experience in all industries and a wide range of products. We understand how your specific labeling needs change from year to year. On top of that, we can deliver a quality product to withstand any condition. Industrial labels on appliances need heat resistance, beer labels need moisture resistance. We are always testing new innovative labeling techniques. We always ensure they look good on our research and design labels. This is first, for sheer curiosity, but also because we care about perfecting all our labeling solutions. By the time you decide to use Motion Coat on your label, it’s ready. We’ve worked out all the kinks and know the ins and outs of what is possible for your aesthetic. Great Lakes Label is a beta testing site for some of our suppliers. This allows us to also get a first look at up and coming trends. We are on the cutting edge of the flexographic label printing industry. If you haven’t already noticed, we take your labeling needs seriously. We guarantee a professional grade product every time. A label that meets all requirements for your industry. We also guarantee a durable label that can withstand any condition. To us, it’s important that your label captures the attention and imagination of your customers. The grocery aisle is a competitive arena with many, many options for them to choose from. We offer solutions to make your product stand out. On top of this, we offer an in-house design team to make your wildest dreams a reality. Learn even more about how to incorporate these techniques into your label design. So, download our e-book, The Complete Guide to Innovative Labeling Techniques. It even covers all the innovative techniques mentioned. It also teaches you what “sensory marketing” is and how it is impacting your sales. You’ve put a lot of thought into the design of your product. The labeling and packaging are key elements to being seen on the grocery store shelf after all. Have you thought much about inclusive packaging along the way? First, what is inclusive packaging? Not everyone has an easy time opening up various packages, or reading small fonts. It’s not just about creating packaging and labels that the elderly can open and understand with ease, but children, those with disabilities and the abled bodied as well. What is your product worth if a large corner of the market finds it inaccessible? Of course if the product is meant to be safely out of the hands of children, accommodations should be made. If the product is meant for all to use, however, accessibility should be a priority. The trendy minimalistic style you desire for your label can still be achieved with larger font. The drink can still be tightly shut with an easy to open lid. The colors used in your design can still have enough contrast so that everyone can clearly understand the content. While excessive packaging is an issue for those considering environmental consequences, it could also be an issue here. The less packaging there is, the easier it is for the customer to start using your product. What can be eliminated, or reimagined, in order to create a more efficient experience? As time goes on and more developments are made in the packaging material industry, the more options you have. That being said, starting with smart design can be just as effective while we wait for those innovations. One simple example how you can make your products more accessible is by including braille. Any embossing or tactile screen can create the desired effect on your label. It enhances the label design as well as the ease of access for everyone. Are you interested in learning more about what Great Lakes Label’s products? Download our comprehensive label production and design guide. 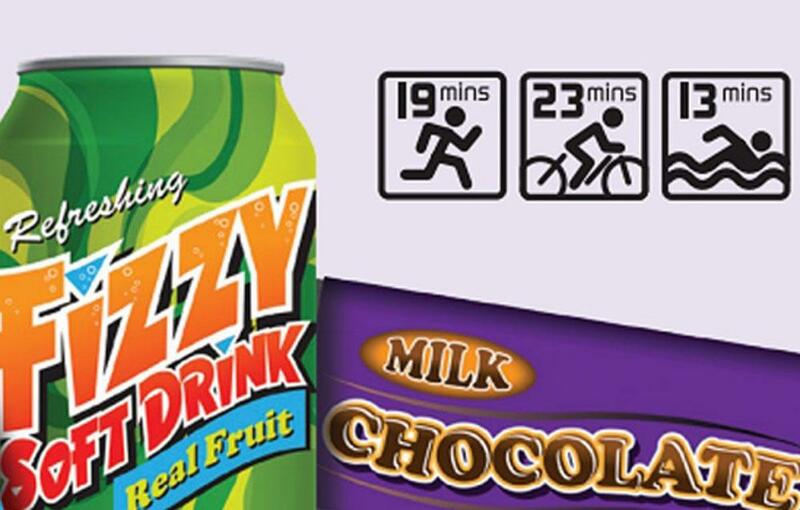 Are Exercise Logos on Food Labels Our Future? Officials from Britain’s Royal Society of Public Health are considering the idea of adding logos to food to specify how much exercise is needed to burn off the calories from eating the product. The images may vary from running to biking to swimming, but the message is the same. The goal is to empower customers and to assist health-conscious consumption. Why do Exercise Logos Matter? Exercise generally counts for 20% of health improvement. However, food counts for typically 80%. This indicates the logos are a step in the right direction in getting customers to decrease spending on processed foods. These labels are based on the numbers if a 170 lb man, so the amount of exercise needed would actually differ from person to person. An elderly person requires different amounts and types of exercises than a young, fit person. It’s also been shown that calorie counts in fast food restaurants do not deter customers from ordering unhealthy food. Would this addition to pressure sensitive labels get people thinking more about what they consume or would it become one more piece of information to ignore? Learn more about designing effective, professional grade labels? Download our Label Project Guide. 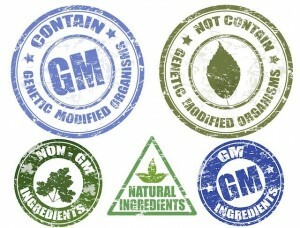 How Does GMO Labeling Impact Your Brand? Vermont’s legislation on GMO labeling will go into effect on July 1st. While this may already impact some brands and their labels. It may also not impact others…yet. Whether or not you consider this a positive change, here are some things to consider when converting labels to the new GMO standard. For some companies, there may be a cost in producing new labels to fit the new GMO labeling legislation. On top of the design, the change would require reviewing the supply chain, checking recipes, evaluating logistics, etc. Not to mention the daily $1000 penalty if you label your genetically modified ingredients incorrectly. While some companies are opting to retire products altogether, others are choosing to replace the genetically modified ingredients. Depending on what is being swapped, this can increase the price of the product. While avoiding the cost of the penalty, the cost of using other sources can still change a brand’s approach. On top of the potential price increase that comes with swapping ingredients, this strategy can also affect the taste of the product itself. For example, switching from oils (like cottonseed oil to something like peanut oil) can also introduce new allergens that customers would need to be aware of. If this is the case, spending time and money on making your customers aware may play an important role. Another solution is to halt all shipments to Vermont completely. If GMO labeling legislation grows in popularity, this may not be a route brands can continue taking.